Sercos International offers a new version of the Sercos® Monitor (version 3.5.4), available as a free download from www.sercos.org/downloads/tools. This diagnostic tool, developed and updated by the Steinbeis transfer center, provides a comprehensive and detailed analysis of data traffic in Sercos III networks. 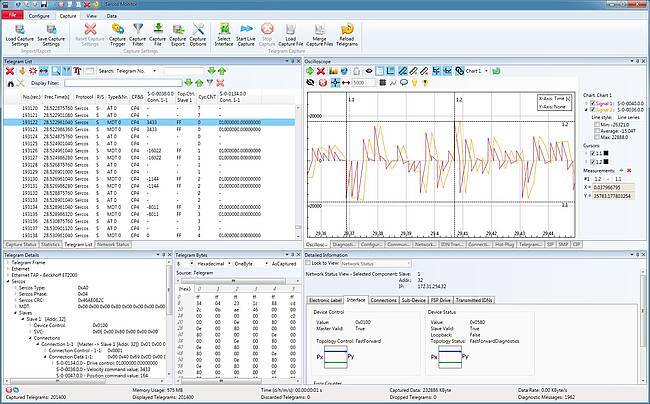 A new Sercos analysis capability supports the Sercos oversampling function, allowing individual samples of process data to be accessed within the monitor. Manufacturer-specific SPDML files with parameter descriptions can also be created via the Sercos Monitor based on a Sercos startup process. A configuration dialog for the manual configuration of CIP Safety functions has also been implemented. An extended S/IP analysis with the use of optimized filters and individual telegram types is now available to the user in addition to an extension of the oscilloscope function for an improved graphical analysis of telegram data. PcapNg file formats are now supported without previous conversion. Performance optimizations based on multi-CPU-core support for the real-time logging of large volumes of data; for example, for the analysis of sporadic errors in production systems, is now provided. For exact time stamping and a port-specific resolution of the Sercos telegrams, the new version offers the integration of the Kunbus TAP Curious Ethernet monitor. “The Sercos Monitor has become an indispensable software tool for the entire Sercos community. Through the continuous development of the functionality and user-friendliness, manufacturers and users are able to localize the cause of errors on a highly targeted basis and significantly increase the availability of the machines and systems,” stated Peter Lutz, Managing Director of Sercos International.